Born in the village of Fota /Dagyolu (Cyprus) on 28 March 1944, the poet finished his primary education in his village, high school in Nicosia, and was studying for a degree in Law at the University of Istanbul when he was killed in ambush at Erenköy, Cyprus during the inter-communal strife in 1963. His first poem was published in the literary paper Nacak, and most of his other poems have been published after his death by his close friend poet Orbay Deliceirmak in a book titled Bir Sehitten Seslenisler (Voices from a Dead Hero). 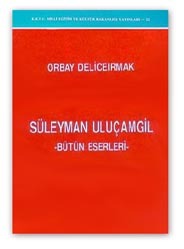 In his poems Süleyman Uluçamligil mainly used the patriotic themes describing the situation of his fellow countrymen had been subjected to. He has written in the -serbest nazim- (a non-rhymic poems) style, using a purer form of Turkish language. Kimimiz ölürken diyoruz, Kimimiz ölürkana."